"Excalibur Charters - a cut above the rest"
Welcome to Eastbourne and our angling/diving website where we believe we offer you a better chartering experience than that of our competitors. Our vessel is located at Sovereign Harbour, Northern Harbour, Eastbourne on the Sussex coast. 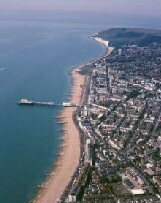 Our boat charters are operated by Skippers Barry Domsalla & Lance Brown who have fished the area off Eastbourne for some 30 years. We offer you the opportunity to experience and enjoy Deep Sea Fishing and Diving aboard this fully Yellow Coded M.C.A licensed, fast and comfortable well equipped twin engined Blythe 33 catamaran hull vessel. This licence gives us the opportunity to range up to 60 miles from a safe haven, be that on either the English or French Coasts. We also offer a further range of extra services as our vessel possesses a M.C.A Brown Code Workboat Licence. Please browse through our website to see what we offer.